West Ham boss Alan Pardew said Steven Gerrard's last-gasp equaliser for Liverpool in stoppage time had robbed his side of FA Cup success. Pardew said: "It felt like a defeat when the third goal went in. We rallied and had a great chance in extra time. "We had to dig in. This was a top team we were playing, but I felt we were going to win. Only a 35-yard Gerrard smasher was going to change that. "The players have been magnificent - we are proud of the way we played." 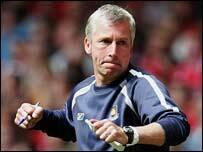 Pardew added: "We can take a lot from this game. The first trophy is always the hardest to win. "But this team will come back - we produced a performance to show we can live with the big boys." West Ham captain Nigel Reo-Coker was inconsolable as he tried to come to terms with his team's FA Cup final defeat to Liverpool on penalties after the game ended at 3-3. Reo-Coker told BBC Sport: "I can't describe it how I feel at the moment - gutted because I think we deserved to win this game. "The players put in a fantastic effort, but it just wasn't to be for us. "It was a marvellous FA Cup final and we gave all we could. I hope everyone was proud - it just wasn't our day." West Ham were leading in stoppage time at 3-2, before Steven Gerrard's superb equaliser - the second time the Liverpool captain had pulled his side level. Like Pardew, Teddy Sheringham was convinced West Ham had won the game. "It is a cruel game and we were outstanding. We had to dig deep, but we just couldn't dig deep enough. "It was a great FA Cup final and there were fantastic moments going on all over the pitch."